A Barbara Stanwyck femme fatale seduces a good man, lures him into a murder plot and then ruthlessly double crosses him when he's no longer useful, discarding the poor dupe like yesterday's garbage. Sound familiar? This time it's Wendell Corey's assistant district attorney Cleve Marshall who's eaten up and spat out, rather than Fred MacMurray's Walter Neff, but the similarities between Robert Siodmak's accomplished, production line Paramount noir and Billy Wilder's magnificent Double Indemnity (1944) are immediately obvious and undeniable. This is still a fine film, however, and has enough points of divergence to keep things interesting, shifting shape a number of times before finally revealing itself to be a tense courtroom drama, in which Cleve must prosecute his own lover for the murder of her Aunt Vera (Gertrude W. Hoffman) and engineer his own defeat to ensure her freedom. Perhaps the biggest difference between Thelma and Phyllis Dietrichson is that the former really does fall in love with her sap this time around and comes to regret eloping with her secret boyfriend, a no-good Florida cardsharp named Tony Laredo (Richard Rober), her guilt swelling until she can take it no more and pulls their getaway car off the road and over a cliff into a fiery inferno. A truly shocking development that put me in mind of Otto Preminger's later Angel Face (1952) with Bob Mitchum and Jean Simmons. Phyllis, or Martha Ivers for that matter, would never have been capable of Thelma's genuine contrition, even if it comes too late to save Cleve from total ruination. Perhaps the most interesting mystery about The File On Thelma Jordon is that of its author. The movie's screenplay by Ketti Frings is based on an unpublished screen treatment by one Marty Holland, a studio typist discovered by Preminger whose novel Fallen Angel he made into a superlative noir with Dana Andrews, Alice Faye and Linda Darnell in 1945. According to Domestic Suspense, Marty was really a young woman named Mary Hauenstein from Beaverdam, Ohio, who published a series of pulp novels around the time of her late Forties successes in Hollywood before returning to the obscurity from whence she came and dying of cancer in 1971. Little is known about her life and Marty seems to have been a dame every bit as evasive and tricky as one of her heroines. 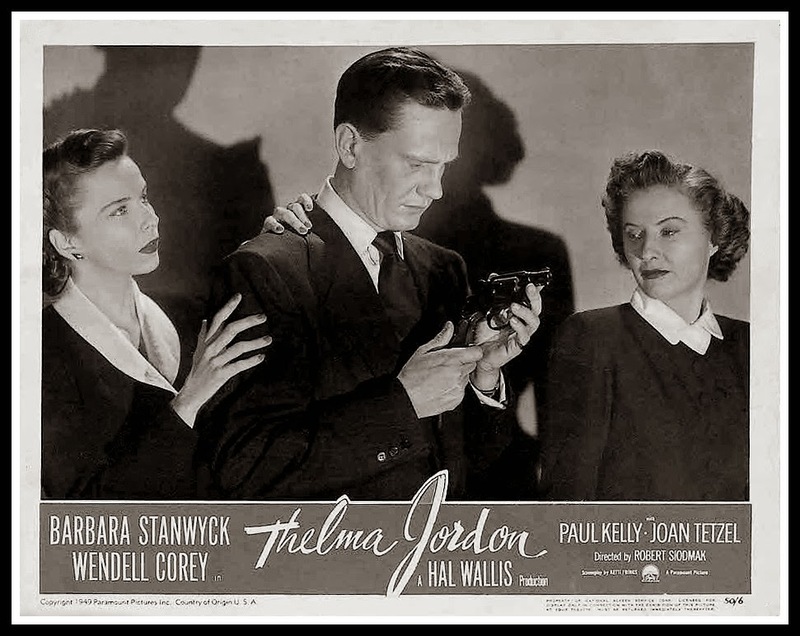 Check out the forthcoming Director's Special issue of The Dark Pages, edited by the brilliant Karen from Shadows & Satin, for a fuller appreciation of Siodmak's direction of The File On Thelma Jordon by yours truly. The issue will focus on the noir output of both Siodmak and Anthony Mann and hit print in May. Get yours here. It's been years since I saw "The File on Thelma Jordan". Barbara Stanwyck is excellent in the film - perhaps far from the incendiary Phyllis Dietrichson, but convincing and sympathetic. Its one of those fine films (like, say "While the City Sleeps") which you can re-unite with after years and loose yourself in totally. And, yes, "Angel Face" is a great comparison! And well done with "The Dark Pages" - I'll be looking into getting a copy of that, Joe! Thanks so much Sidney, a great pleasure to hear from you again. Yeah Thelma Jordon is always worth checking in with, I do love a bit of Stanwyck. A class act all the way and able to elevate even mediocre material to great heights. And you're quite right about While The City Sleeps, a fine cast and an interesting mamma's boy killer some years before Psycho.